Local confluence is an important property in many rewriting and transformation systems. The notion of critical pairs is central for being able to verify local confluence of rewriting systems in a static way. Critical pairs are defined already in the framework of graphs and adhesive rewriting systems. These systems may hold rules with or without negative application conditions. In this paper however, we consider rules with more general application conditions — also called nested application conditions — which in the graph case are equivalent to finite first-order graph conditions. The classical critical pair notion denotes conflicting transformations in a minimal context satisfying the application conditions. This is no longer true for combinations of positive and negative application conditions — an important special case of nested ones — where we have to allow that critical pairs do not satisfy all the application conditions. This leads to a new notion of critical pairs which allows to formulate and prove a Local Confluence Theorem for the general case of rules with nested application conditions. 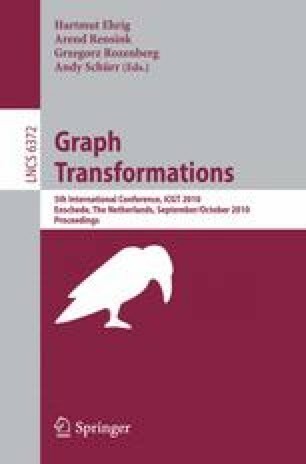 We demonstrate this new theory on the modeling of an elevator control by a typed graph transformation system with positive and negative application conditions.